Today, individuals and organizations regardless of expertise and social status are making all-out efforts to tackle diverse challenges arising from local communications to world economy to global environment. To blaze a new path to a better future using unprecedented technologies and innovative ideas. We invite you to view examples of open innovation initiatives TEPCO co-created with specialists, companies, and organizations. Through challenging ourselves with new technology, dealing with various businesses, we strive to contribute to society’s development by creating new value for the lives and businesses of consumers and business people. We have opened to TEPCO CUUSOO to realize such future. By partnering with you, we will be able to tackle issues we could not before. It is our mission to create a better future by openly cooperating with everyone as we move forward. TEPCO CUUSOO is calling for innovative technologies and inspirational ideas to address the pressing challenges. Please submit your proposal for each challenge. When the result is determined, we will contact you. If a proposal passes the first evaluation, further information will be asked in the next stage. we proceed with a business review, we will set up an opportunity to discuss the details of your proposal. It may be a face-to-face/online meeting or presentation. As the proposal proceeds to the final stage, and when both parties come to an agreement, a variety of methods may be employed such as joint development projects, orders placements, and others. Proposal submission is done in four simple steps. Your proposal is restricted to your own expertise, technologies, products and/or ideas that utilize services of a third party. Register and get an account (free of charge). Have your e-mail address or SNS account. Choose the challenge you want to tackle. Please submit your proposal. More information may be provided after logging in. Submit proposal summary. Proposal must be submitted in writing. PDF uploads are only accepted as supporting materials. When the result is determined, we will contact you at your e-mail address. TEPCO CUUSOO starts with a simple registration. What do I need at submission? When you are submitting your proposal, you need to tell us your name, and if applicable your company name. Results will be notified usually within 10 business days from submission. Depending on the topic you choose, notification may take longer. Is there financial transaction involved? No. Financial transaction is not involved within TEPCO CUUSOO. Financial transaction occurs only when official purchase order is placed. For more information, please see TEPCO CUUSOO Terms of Service. A new category, "PV in HOKKAIDO - Contest Seeks Best Models for Predicting Power Output of Solar Power Plants in Hokkaido, Japan" has started. A new feature "Interest Setting" has ben added. Now, users can receive information on challenges related to your interest by setting them. "Seeking: Robotic underwater inspection and maintenance technology to lower costs, increase efficiency for offshore wind power generation facilities" has been added. TEPCO CUUSOO has been renewed. The categorization has been changed. Some topics have been closed. "No.4 Open Innovation Case by TEPCO : Stand-Alone Power Supply Unit" has been added into Open Innovation Cases. 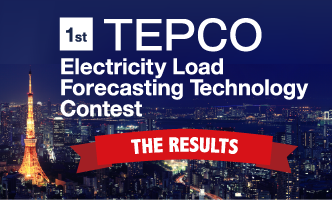 "Electricity Load Forecasting Technology Contest" has started. "Solution for diagnosing deterioration of storage battery" has been added into Challenge category. "No.39 Consideration of effective removal from Unit 1 Reactor Building Upper Part" has been added into Decommissioning category. "No.38 Dose reduction in Reactor Building (Hydrogen accumulation evaluation technologies)" has been added into Decommissioning category. "Ev Utilization Application Idea Contest" has started. "No.17 Ideas for public services using utility pole" has been updated. "No.37 Effective treatment of contaminated water with high salt (Na, Ca, Mg) content" has been added into Decommissioning category. "No.36 Effective method to remove Iodine and Ruthenium in contaminated water" has been added into Decommissioning category. A new category, "Expertise and Technologies in Decommissioning" has started. A new category, "Seeking Big Data Usage Partners" has started. A new category, "Procurement" has been launched. 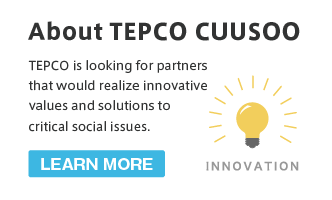 TEPCO CUUSOO has been launched as an official open innovation platform for Tokyo Electric Power Company (TEPCO).